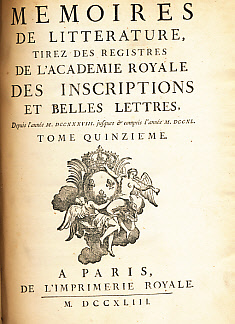 Barter Books : Academie Royale : Memoires de Litterature, Tirez des Registres de l'Academie Royale des Inscriptions et Belles Letters, Depuis l'Année MDCCXXXVIII Jusques & Compris l'Année MDCCXL. Tome Quinzieme. 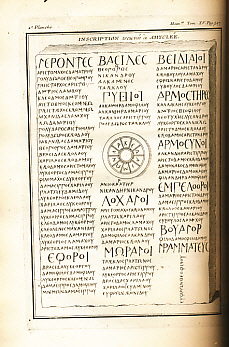 5 plates, facing pages 397, 433 and 456. 270 x 200 mm (11 x 8 inches) - [iv], 816pp. G : in Good condition. Cover rubbed and edgeworn. 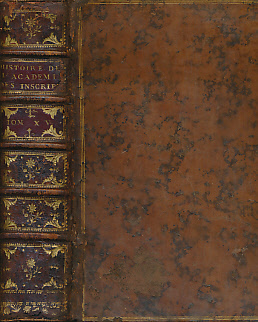 Heraldic bookplate on pastedown. Text block tight, with occasional foxing and browning.